Of all the sensory delights that a garden offers, the most romantic of all is fragrance. While a garden is typically designed to delight the eye, to be truly romantic, fragrance is essential. Drifts of a sweet scent as one strolls along walkways or sits on a bench make time spent in the garden more enjoyable, relaxing and sensuous. 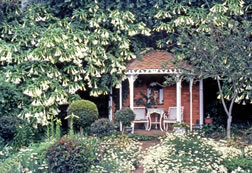 Now is the time to review your existing plantings and to plan where you can add plants with fragrant blooms. Many perfumed plants are also evergreen, so if your garden is rather bare and bleak in winter, consider filling the gaps with fragrant evergreens. Make a note of whether your chosen spot receives sun, partial sun or is in full shade. Then select a plant, bearing in mind that it must be able to thrive in the light conditions and be able to tolerate the frost levels in your garden. 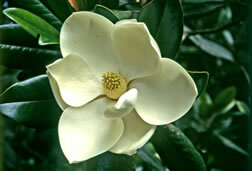 Southern magnolia (Magnolia grandiflora). This evergreen tree grows very slowly to a height of 15m. The glossy leaves, as well as the large scented white blooms, make it an attractive garden plant. The cultivar 'Little Gem' is compact and small, reaching only 6m in height. It tolerates moderate frost. Australian frangipani (Hymenosporum flavum). This upright evergreen tree grows to a height of 8m. In spring it bears masses of sweetly scented butter-yellow blooms. It tolerates moderate frost. 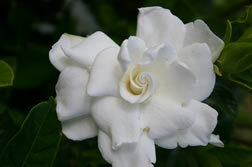 Starry gardenia (Gardenia thunbergia). This 5m-tall indigenous shrub can be pruned to form a small tree. Masses of highly fragrant, large, star-shaped blooms appear in summer. It tolerates mild frost. African dog rose (Xylotheca kraussiana). The glossy evergreen foliage of the indigenous 6m-tall shrub or small tree, as well as its sweetly scented white flowers, make it a perfect choice for a small garden. It tolerates mild frost. Forest elder (Nuxia floribunda). This 6m-tall indigenous evergreen tree has a spreading crown, making it a lovely shade tree. It bears clusters of tiny white fragrant blooms from May to September. For frost-free gardens only. Sage wood (Buddleja salviifolia). 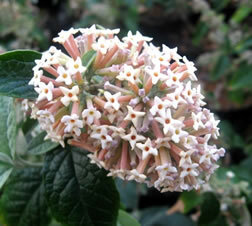 This fast-growing, indigenous and water wise shrub can be pruned to form a small tree. Its height is 4m, with a 3m spread. Scented creamy-white flower spikes are borne on its long arching branches in late summer. It tolerates severe frost. 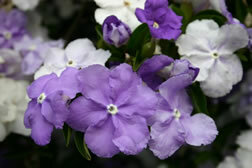 Yesterday, today and tomorrow (Brunfelsia pauciflora 'Floribunda'). 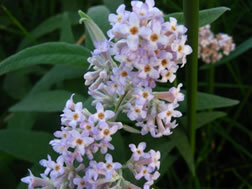 In spring and summer this 3m-tall shrub bears fragrant deep mauve flowers, which fade to lavender and finally to white. It tolerates mild frost. Plant in sun or partial shade. Brunfelsia pauciflora 'Macrantha' has larger blooms and grows to 2m, but this cultivar can only be grown in frost-free gardens. Gardenia (Gardenia augusta). This 3m-tall evergreen shrub bears masses of large, sweetly fragrant, creamy-white flowers all summer long. It tolerates mild frost. 'Florida' is a 2m-tall cultivar with double blooms. The cultivar 'Golden Magic' has yellow blooms. 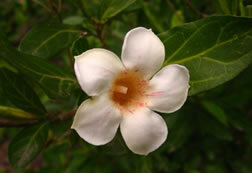 The low-growing Gardenia augusta 'Radicans' can be used as a ground cover. Moonflower (Brugmansia x candida). With its large highly perfumed trumpet-shaped blooms this 5m x 3m deciduous shrub is the star performer of all night-scented plants. It tolerates moderate frost. Note: The blooms of all moon flowers are highly poisonous and gardeners with young children may choose to postpone planting them. 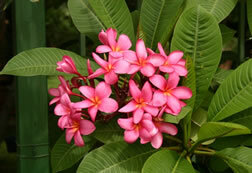 Frangipani (Plumeria rubra). In frost-free gardens this highly scented shrub or small tree is a must. It grows to a height of 3-4m. September bells (Rothmannia globosa). This 5m-tall evergreen indigenous shrub has an upright growth habit, making it ideal for small gardens. In early spring it bears a profusion of creamy white scented blooms. It tolerates mild frost. Weeping sage (Buddleja auriculata). This shrub or small tree bears spires of tiny sweetly-scented cream or lilac flowers from July to September at the ends of the 'weeping' branches. It tolerates moderate frost. False olive (Buddleja saligna). The small creamy-white flowers of this 5m tall indigenous shrub are borne in dense sprays at the ends of branches and have a lovely honey scent. They appear from August to January. It tolerates heavy frost. Chinese jasmine (Jasminum polyanthum). The pink buds open to cascades of white fragrant blooms from late winter into spring. This evergreen climber tolerates heavy frost. 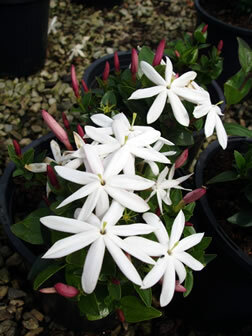 Star jasmine (Trachelospermum jasminoides). The star-like small blooms that appear in spring and summer are highly perfumed. This evergreen grows to 7m and can also be grown as a large ground cover. It tolerates moderate to heavy frost. Starry wild jasmine (Jasminum multipartitum). This indigenous 2-3m tall climber bears masses of sweetly scented starry blooms in late spring and summer. This evergreen can also be used as a large spreading shrub. It tolerates mild frost.